What it does: After just two coats, its Exclusive NutriPlumpTM formula dramatically plumps lashes up to 600%* for unheard-of thickness, fullness and flutter. The Brush: It’s a very soft bristle brush that expertly picks up just enough of the product that you need, without having to remove off too much excess. The Effect: Va VA VOOM! Check out my before and after photo below. 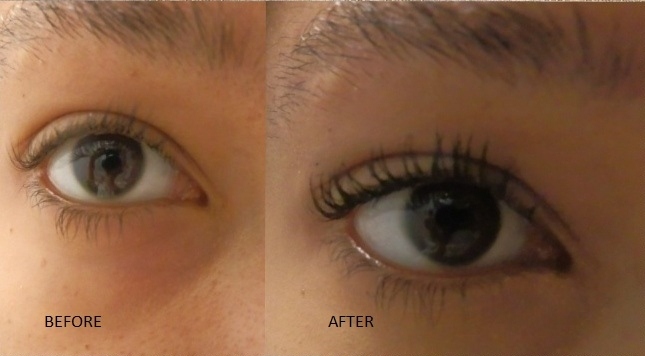 My lashes were instantly fuller, longer and darker. I didn’t even curl my lashes before applying the mascara. It also gave my lashes great depth. I don’t have any eyeliner on in the photo below. Bottom Line: An absolute must-have for a dramatic look without having to apply false lashes. Disclourse: I received this mascara for review from planetbeauty.com. They will be sponsoring a giveaway of this mascara on Monday with 3 luck winners, so stay tuned. Thank you again for the mascara that I won! I received it today and of course like any beauty lover I had to immediately remove eye makeup to test this out! Loving it and it hasn’t smudged (had to go back to work). Thank you!